To improve therapeutic outcomes from CDs, attempts at addressing limitations of current 2D and animal models include creation of intricate three-dimensional (3D) cardiac tissue constructs with enhanced recapitulation of native myocardium that are useful for mechanistic studies, therapeutic discovery, and testing, with pertinent examples illustrated in Fig. 1 [5–31]. To date, a variety of techniques to create 3D cardiac tissue models have been proposed, each presenting with advantages over currently available models, including incorporation of highly controllable environments for cellular- and molecular-level studies. Recent in vitro research has also advanced the use of human-derived cardiac cells, made possible by wide availability of methods for cardiac differentiation of human stem cells to generate patient-specific and genetically-edited cardiac cells . Additionally, significant emphasis on emerging biomaterials and micro−/nano- scale technologies has opened new opportunities to enhance the functionalities of engineered cardiac tissues through precise control over cell-cell and cell-ECM interactions [31, 33–36]. These models also incorporate intricacies of the native myocardium, including mimicry of anisotropic structure and accommodation of electrical and mechanical stimulation. Notably, 3D microengineered cardiac tissue models have been successfully utilized to better understand the biological basis of disease progression and enhance the efficacy of pharmaceutical testing of candidate therapeutics. The most implemented approach for subsequent studies of CDs is through animal models [37–47]. Such models range from small to large animals, and incorporate a variety of both environmentally- and genetically-derived diseases, to study corresponding cardiac pathophysiology. Specifically, environmentally-related diseases can be studied in animal models by delivery of physical, chemical, or metabolic insults, such as through extreme change in diet or chemical administration [38, 43, 48]. Particularly, the use of animal models to study environmentally-related diseases is advantageous in the ability to recapitulate whole organ-level response to such systemic insults, an aspect that is lacking in current in vitro models. For example, to model myocardial infarction (MI), Brooks et al. chronically administered isoproterenol to mice to induce MI-related symptoms, such as impairment of diastolic function and changes in heart size, allowing for study of disease manifestation and related secondary injuries . Additionally, to model acute MI, left coronary artery (LCA) ligation has been established as a technique for arterial occlusion to induce myocardial infarction in multiple types of animal models . Gao et al. utilized this method to study heart remodeling and secondary pathways that occur after ligation-induced MI in mice. Significant alterations in echocardiographic characteristics, in addition to heart size and weight, were demonstrated in mice that experienced MI, thus demonstrating capabilities of animal models for systemic-level pathophysiology . On the other hand, the use of transgenic animal models allows the study of genetically-derived diseases to elucidate the role of specific genes in manifestation of corresponding pathology, and potential responses to pharmaceuticals. For example, to study atherothrombotic disease, transgenic mice with mutant apolipoprotein-E have been used to recapitulate the lipoprotein profile observed in hyperlipidemia patients, causing atherosclerotic lesions to develop . In vivo animal models have provided fundamental knowledge into the biology of cardiac disease, and correspondingly have served as helpful models for the translation of observed pathology into potential pharmaceuticals [37–47]. However, the inability for precise control at molecular- and cellular-levels hampers the amount of mechanistic information that can be gained from these models. Incorporation of cardiac tissues within in vitro models has enabled the direct mechanistic studies of CDs that complement the knowledge gained from in vivo models for enhanced clinical translation of disease-related findings. There have been a vast number of in vitro models to date utilizing neonatal CMs derived from animals for cardiac tissue engineering due to the ease of access and availability of these cells [31, 35, 36, 51–57]. For example, Zimmermann et al. demonstrated the utility of mechanical stretch in an in vitro model to generate aligned cardiac tissue from neonatal rat CMs and collagen hydrogel that resembles the structure of the native myocardium . Saini et al. developed cardiac micro-tissues, with variable geometrical features and CM to cardiac fibroblast (CF) ratios within gelatin methacrylate (GelMA) hydrogel, to assess the role of tissue confinement and co-culture ratio on functionalities of the engineered tissues . Their findings demonstrated that supplementation of CMs with CFs enhanced the tissue structure and protein expression, in addition to delineating the prominent role of architecture on tissue formation. These in vitro models have also been advanced for elaborate cardiac tissue studies, with an emphasis on modeling CDs [58–69]. For example, Mosadegh et al. created a 3D model for cardiac ischemia using rat neonatal CMs within a paper-based platform . Incorporation of cell culture within this in vitro model allowed for establishment of an oxygen gradient and the subsequent study of its effect on encapsulated tissue. Particularly, CF migration was observed against the oxygen gradient, in response to signaling from CMs, providing pertinent information about the intercellular mechanisms that occur during ischemia. Despite the significance of tissue model systems developed using animal-derived cardiac cells, the discrepancies inherent between animal and human physiology significantly limits the translation of knowledge gained from these studies to implementation into the clinic . To complement these models, in vitro models that provide a tunable microenvironment for precise biological studies are utilized with incorporation of human-derived cells for further insight into CD research for translational applications. Due to difficulties inherent in the isolation of human adult cardiomyocytes (CMs), their use within in vitro assays to date has been limited. The advent of CM differentiation from human pluripotent stem cells (hPSCs), including induced pluripotent (hiPSCs) and embryonic (hESCs), has introduced a potentially unlimited source of human cardiac cells for use within in vitro assays for disease modeling [70–75]. Cardiac diseases arise in one of the following ways: through genetic predisposition, acquired or both. Therefore, methods for disease modeling generally fall into one of the following categories to highlight the different methods of disease induction: 1) either diseased cardiac cells are directly incorporated into these in vitro models, or 2) healthy CMs are subjected to external insults to model the role of environmental impact in disease etiology. This review will focus on models derived via the former approach, through stem cell-based techniques that allow for derivation of patient-specific and/or genetically-edited cardiac cells for precise modeling of disease manifestation. Specifically, to generate such diseased cardiac cells, hPSCs are generally either reprogrammed from patient-derived fibroblasts, or genetically modified from wild-type (WT) hPSCs, to produce the cells with diseased genotype for CM differentiation and subsequent incorporation into cardiac models . In the following sections, the use of these cells within 2D assays will be discussed. There is now increased use of 3D cardiac models that provide greater freedom in complex tissue-level interactions in addition to the incorporation of critical physiologic conditions such as whole-tissue electrical stimulation and establishment of precise gradients. 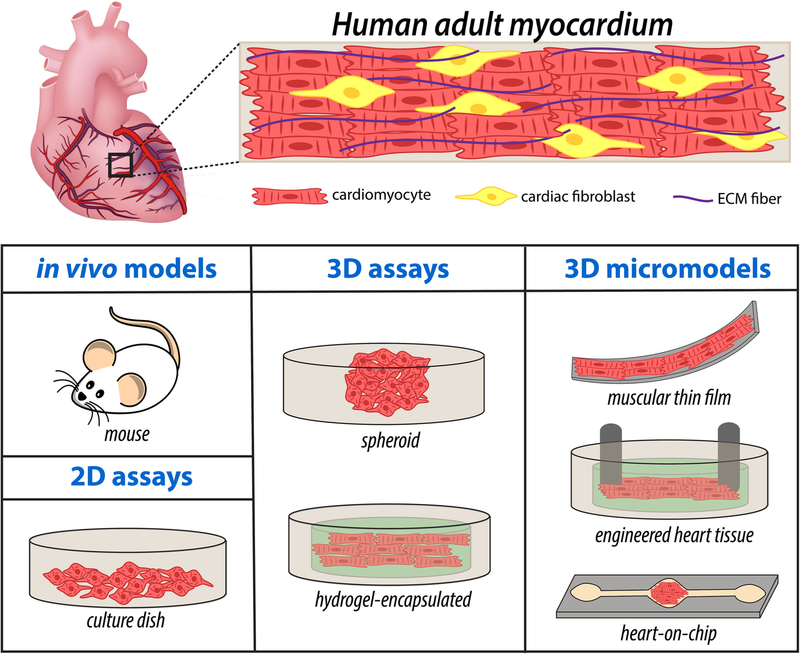 Specifically, the integration of methods such as photolithography, soft lithography, and 3D printing along with advanced biomaterials and human CMs has enabled the emergence of various biomimetic 3D human cardiac tissue microengineered models [5–31, 62]. The complexity of these 3D microengineered models continues to advance for further physiological relevance, including methods to induce cardiac tissue maturation through use of co-culture of multiple cell types, incorporation of surface topography, and electrical and/or mechanical stimulation . Engineered cardiac tissue models within microfluidic platforms have the advantage of providing highly controllable fluid flow to model the vasculature within the native heart, in addition to increased throughput due to significant reduction in necessary reagents and cells through platform miniaturization . Mathur et al. incorporated hiPSC-CMs into an ECM-coated straight microfluidic channel, composed of polydimethylsiloxane (PDMS), with bordering arrays of microposts to serve as endothelial-like barriers for nutrient and drug diffusion  (Fig. 2a). To validate the model, therapeutic agents administered via the media channels served to model intravenous drug administration and expected responses were observed from the aligned hiPSC-CM tissue layer, better modeling the tissue-scale response than other cellular-level studies. 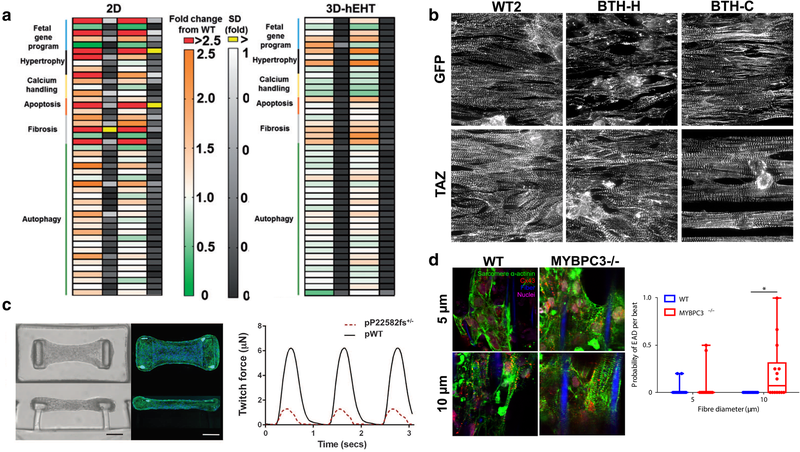 Recapitulation of cardiac response in addition to the ability to control external inputs such as drug administration, while measuring relevant output such as contractile response demonstrate the utility of this platform in 3D cardiac tissue modeling.